The most common types of shingles for roofing are standard asphalt, laminated asphalt, wood and slate. Costs vary widely, and each option comes with distinct pros and cons for homeowners. Four out of five homeowners choose asphalt shingles, but other factors may make cedar or slate shingles a better option for your home. Installed asphalt shingles cost less than slate or wood. Quality asphalt shingles are rated to last up to 30 years. 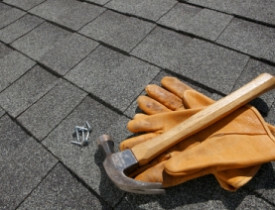 Asphalt shingles are used for about 80% of roof replacements in the US. They are suitable for almost any home style in almost any area. Installation and replacement is simple and inexpensive. The shingles are light and do not require any structural reinforcement. Asphalt shingles require little maintenance and are weather-resistant (although you may have to pay extra for treated, stain-resistant asphalt shingles in humid areas). Some new composite asphalt shingles are made from recycled and eco-friendly materials. Because they are so ubiquitous, asphalt shingles are not very distinctive. They do not last as long as slate shingles. Laminated asphalt shingles are more attractive than standard asphalt shingles. They have a thicker, more three-dimensional appearance, which makes them look more like slate or cedar than standard asphalt. They are rated to last up to 50 years. They’re more expensive than standard asphalt shingles. Wood shingles cost less than slate. Wood shingles have a classic, rustic look. They are lightweight and don’t require additional reinforcement. They are relatively easy to install, repair and replace. Wood shingles cost more than some asphalt shingles, but high-quality cedar shingles are comparable to high-quality laminated asphalt shingles. They are less fire-resistant than other types of shingles. They last up to 30 years, but may damage easily. They require more maintenance than other shingles. They must be repainted, cleaned and kept dry to ward off algae, insects and animals. With natural variations of color and shape, slate shingles are very distinctive and attractive. They can last up to 100 years. They resist fire and hail damage. Installed slate can cost up to $1,000 for 100 square feet. Installation requires special tools and expertise. Slate shingles are heavy and require expensive structural reinforcement. Though they withstand weather, they are brittle and can break easily underfoot. Replacement is costly and complicated. Asphalt shingles are the most common roofing material in the United States, but slate and wood shingles also offer unique aesthetics and other advantages. No matter which of these 3 types of shingles you choose, hire a reliable licensed roofer to install them.